I want to share with you today about how to create a turn key business, and specifically, I want to talk about the 5 Components of a Turn Key Business. Great business leaders build great businesses that can run without them. That’s what I encourage all the business owners I work with to work toward. To create a business that can function and perform consistently and predictably, without their constant presence and their constant attention. Every business has to have these 5 basic systems. You might call them the 5 major systems of a turn key business. If you’re a soloprenuer or a small business owner with just 1 or 2 employees, you may want to take HR and make it a sub-component of Admin and only have 4. But if you have multiple employees, and you’re going to grow to even more, you definitely want to have a separate component that’s HR. This area covers things like talent acquisition, training and development, coaching and correction, conflict resolution, performance management. All of those things are key pieces of your HR system. Admin is typically the back office type things like bookkeeping, accounts payable, accounts receivable, inventory control, data management, compliance issues related to taxes, personnel law, and issues like that. They come under the Admin system, and you want all of that documented and running very well. But the 3 core systems of a business are these first 3: Fulfillment, Selling, and Marketing. All of those systems make up your marketing system. You want to document them all and make sure it’s measurable so that it’s producing the number of quality leads that you want. Then we move to selling. This is lead conversion. Marketing is lead generation, selling is lead conversion. In your business, your selling system may be a transactional system like in a retail business, or it may be a consultative selling system like in professional services, or it may be a bidding or quoting system. Whatever it is, you want to define it, document it, and refine it. Build it out as your selling system. The third core system is customer fulfillment. This is where you deliver your product or service. And you document here exactly how you do this to ensure that every time it’s done with excellence and quality, regardless of who is delivering it. 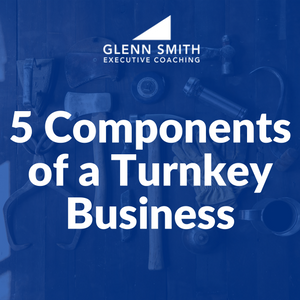 These are the five major systems of a turnkey business. I want to encourage you as a business owner to build it, document it, and train people to operate it. If you document it well with checklists and measurable outcomes, you can train people to do it with excellence every single time. As a business coach, this is what I help people do. This is what business owners hire me to help them with. In fact, we have a program called the Business Acceleration Process that we take business owners systematically through to help them create turnkey businesses. I hope you found this to be helpful and hope it elevates your vision and mindset about what your business can be! 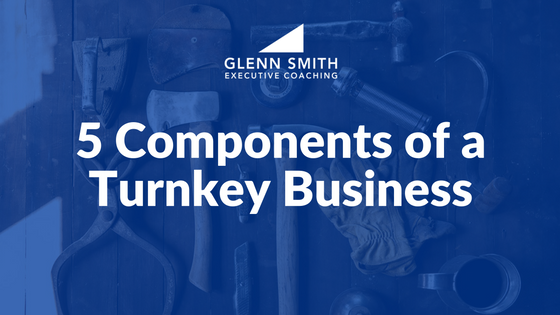 How can small business owners create a turnkey business? Learn the 5 components needed to create a business that can run without you.